Hey you trendly little devils. Did that stint in the PHD program at your local community college not quite work out? Or perhaps your run as a pizza delivery boy was not all the movie Loverboy with Patrick Dempsey made it out to be? If you’re still looking to be all that you can be in the service industry, but haven’t yet found your niche, we here at the Trendliest have yet another friendly and trendy suggestion a fledgling careerist such as yourself can tackle with gusto. We think it’s about time you installed yourself on the trendly path to becoming a Cable Repairman. Being a cable guy is more than just an opportunity to fulfill your sexual fantasies with bored housewives. It’s a job that allows you to “install new features in your customers unit”, “add quality components to their box”, and with cable’s new internet capabilities “upload large files from their hard drive” or gain a huge following by telling groundbreakingly stupid jokes about your white trash lifestyle. In a world that is increasingly reliant on cable television for entertainment, the Cable Repair Person is a god amongst service industry professionals, so much so that they are free to make their own suggested hours and make clients cater to their “I’ll get there when I get there” sense of duty all the while maintaining the freedom to take plentiful lunch breaks and employ liberal use of their time to run errands in the midst of what appears to be a busy schedule. Perhaps the crown jewel of the cable repair job is the Cable Repair van that when pimped out properly can resemble a seductive love den complete with a “If this van’s a rockin’ don’t come a knockin'” bumper sticker. It should be duly noted though that this “love den” should be kept out of site of eight to ten year old demon children curious about cable “hookups”,but more interested in the entrapment of unwitting repair technicians into career and perhaps life-ending molestation charges, which is decidedly unfriendly and untrendy. As long as you steer clear of that one obstacle you should be able to sustain this fruitful and trendly career path to the tops of the repair ranks. Who knows, you may even get to star in a movie about your life, just like famous cable repairmen Jim Carrey and Larry The Cable Guy. What are you waiting for? Git ‘r’ done! Hey couch Trend-thletes, Do you spend the majority of your day touching your testicles, occasionally brushing your nose and brim of your hat while you watch baseball? If you do, odds are you’re looking for a way to parlay those particular talents into at least a summer job. While we here at Trendliest have certainly felt your unemployed pain, we don’t like to see you sitting around dilly-dallying in misery. Instead we went out and found you a trendly job option that puts your skill set to good use and leaves you firmly entrenched on an upwardly mobile career path…or should we maybe say base path. Your “search” for employment is over! You’re qualified for the trendliest job in sports- First Base Coach. 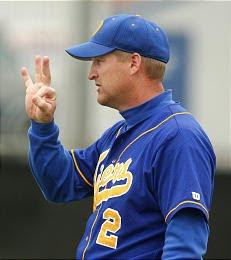 The First Base coach occupation actually evolved from that of a sexual education teacher. 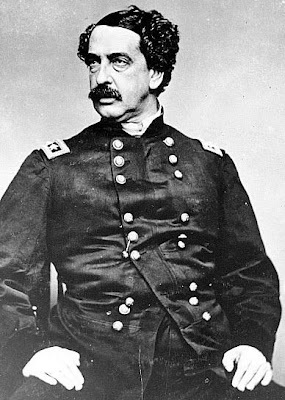 Abner Doubleday, a decorated General who is said to have invented the game of Baseball, was known as a bit of a Casanova in his time spent at Fort Sumter. He spent a great deal of the downtime showing his fellow soldiers how to “french kiss” or as he referred to it, “getting to first base” and was thence given the title “First Base Coach” for that very reason. It’s a little known fact that in the first game of baseball ever played, batsmen were not “safe at first” until they convinced the player covering the bag to engage in a heated make-out session before being tagged with the ball. Likewise, a player was not safe at second until he felt the second basemen over the shirt, which may have had something to do with the game resulting in a scoreless tie. Most First Base Coaches today start off as actual baseball players who have less than fruitful major or minor league careers. As a result of their lack of prestige as players, these former players are not in high demand for careers as broadcasters or head managerial positions. Fortunately, organizations throw them a bone and allow them to stand by first base and pretend that they’re giving valuable advice to players who have the talent to place the ball in a strategic spot within the field of play. This allows them to feel close to the game and that they’re providing a indispensable service to the team by keeping their players at ease while on the basepath. Additionally, while a batter is at the plate. the First Base Coach gets to do all of the crotch tugging and brim stroking he wants under the guise that he’s “giving signs.” In actuality, that’s the third base coach’s job. The First Base Coach is a living, breathing, spitting, ear-tugging diversion. Despite, the reliance on former athletes to fill the role of First Base coach, owners and general managers alike have taken to hiring people with little to no experience for the position, so long as they have an outgoing personality, a basic understanding of the game or a season of little league under their belt. Did we mention that First base coaches can make upwards of around $450,000 a year? Now that’s a salary you could live on for doing a job that demands virtually no effort and transforms your need repeatedly adjust your junk in public into a socially acceptable practice. Now that’s what we call trendly!